If you’ve driven West Swann Avenue, you know it’s undergoing a major facelift at the intersection with Dakota Avenue: wider sidewalks, traffic-calming, and new sense of vibrance. After years of hibernation, in a concerted effort of Boston-based WS Development, Hyde Park Village is flashing new tenants and new infrastructure to invigorate and redefine the thirty-year-old retail center. Hyperbole aside, WS may be the area’s fairytale savior. Back in the mid 1990s, when I was ten, Hyde Park Village entered its own adolescence, and it was the place for teens, families, and young couples. Most contemporary Tampans don’t realize that prior to 2000, Hyde Park Village attracted patrons from as far as Sarasota for its mix of options and open-air ambiance, set in the historic neighborhood of mansions, bungalows, and ancient oak trees. Before suburban malls wooed affluent crowds to their expansive department stores, tasteful Tampa Bay shoppers chose to stroll between Jacobson’s and Polo Ralph Lauren. They ate at The Cactus Club or Selina’s, and for the holidays, bought gadgets at the all-glass Sharper Image store that prominently faced the village center. From 1990 to 2004, my family lived on South Fremont Avenue, just a few blocks from Hyde Park Village. It was the default safe, accessible place for leisure throughout my early life, during which it saw a rise and a fall, as many shopping districts do. As a wee one, I made shortcuts through the village, sometimes bisecting the large specialty retailer (Jacobson’s), while walking home from Wilson Middle School and would occasionally treat myself to ice cream in Snow Circle. A few dollars of allowance seemed to buy plenty. I visited the Gap and Williams-Sonoma on the weekends with my mom, and enjoyed celebratory dinners at Winberie’s, where memories were captured on Polaroid and delivered moments later in a personalized greeting card. For years, to the point that I hated it on principle because they loved it, my parents were at The Wine Exchange every Friday night. Instead I was usually next door at AMC theaters, munching on Junior Mints and watching Leonardo DiCaprio sketch Kate Winslet in Titanic or Pierce Brosnan flirt with death in Tomorrow Never Dies. Slowly, however, Hyde Park Village began to age. Despite efforts to modernize, youthful crowds thinned and stores shuffled around or closed. Jacobson’s departed as part of a corporate reorganization, leaving a major hole in the village’s retail fabric. A gym eventually took its place, but the area came to feel anemic, like a dying body, with so many rejected transplants and a sense of stalled momentum. The excitement of new shopping possibilities near Tampa’s airport offered higher-end retailers and a more climate-controlled experience. By the time my parents moved to Ybor City in 2007, Hyde Park Village was barely holding on to its cinema. In the ten years since then, a few things have happened on the macro level. Large, suburban, enclosed mall construction has slowed; the viable model is now one that mimics a traditional “downtown” with street parking and a mix of residential, office, and commercial activities. Some good examples are The Domain in Austin and CityCenter DC. Millennials and shoppers are also more passionate about local retailers and brands, the result of a resurgent desire for authenticity, quality, and immediate economic impact. “Radical transparency” and a greater awareness of options available online has changed the way we all look at products and services: whereas the 1990s and 2000s were about conformity and status symbols, the 2010s have seen a quest to differentiate and individualize. With all this in mind, you will now find a mix at Hyde Park Village. There are national chains like West Elm, lululemon athletica, Paper Source, and Sur La Table, new entrants to the Tampa Bay market like Suitsupply and Sprinkles (24-hour cupcake ATM!! ), and retailers owned locally, like London Philips, Juxtapose, Downtown Dogs, and Salt Pines. To keep things interesting, the village regularly hosts short-term “flings” with fledgling local businesses, like Seventh Avenue Apothecary candles and coming in May, Uncommon Finds, Tampa’s only niche fragrance boutique. To the credit of diehards, there are a few tenants that have persisted since I can remember—including The Wine Exchange and Pottery Barn. The former AMC theater has continuously functioned as a cinema under various brand names, the latest of which (CinéBistro) turned it into a luxury 21 and up bar and restaurant where you can catch a flick seated in a leather lounger. What’s thrilling now is that it’s undergoing a true renaissance, the investments of which will bring it to an even greater level of popularity than when I was growing up. 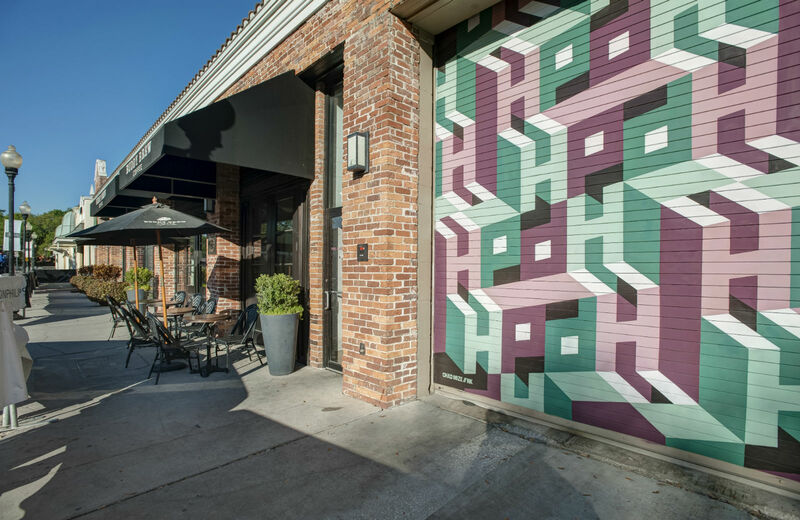 While some popular tenants have left to pursue larger spaces and wider audiences, there was always a glimmer of optimism for Hyde Park Village, because its location and “bones” are so well-integrated with the surrounding blocks, which are at the top of most affluent home buyers’ lists. It’s now is getting the star WS Development treatment: white brick façades, new awnings, on-street parking, even a completely new structure on H-block, where The Sharper Image once stood. Expect to see Meat Market, a South Florida steakhouse chain, open across from Buddy Brew. Other new tenants are TBA, but I have no doubt they will be meticulously considered. If WS’ portfolio of other properties offers any clue, we could get Calypso St. Barth, Jonathan Adler, Vince, or Madewell. My own fantasies include a Tiffany & Co. (a move from International Plaza would be the ultimate twist), Tibi, or Billy Reid. Just as the original development of Hyde Park Village in the mid 1980s was wrought, updating it now is no simple task. Investment is risky and uncertain, but it’s clear to me great things have already arrived, and more are on the way. WS has proceeded cautiously but purposefully, and while headaches and setbacks are normal, the end result will surely attract a new generation of patrons—those who remember its heyday and those who think it’s happening now.